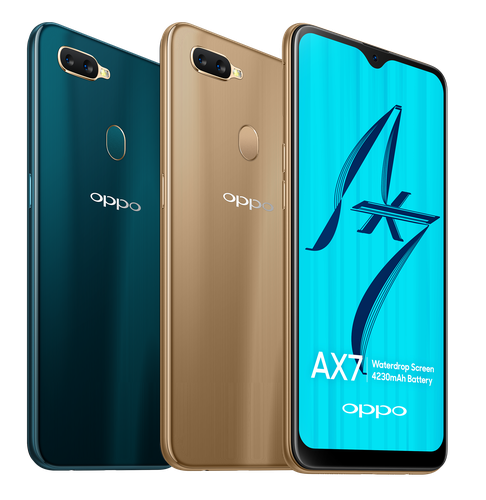 Oppo have announced their first new device of 2019, the budget-friendly Oppo AX7. According to Michael Tran, Managing Director at OPPO Australia, “The AX7 is OPPO’s next premium-grade smartphone, giving Aussies access to a beautifully designed smartphone and amazing features, without having to break the bank. We believe our customers shouldn’t have to compromise on quality or design when choosing an entry-level smartphone." The new device runs on Android 8.1, a Snapdragon 450-series processor, 4230mAh battery, 4GBs of RAM and 64GBs of on-board storage. Then, it's also equipped with a 6.2-inch LCD IPS HD+ display, dual-lens rear camera (13-megapixel + 2-megapixel) and a 16-megapixel seflie shooter. The Oppo AX7 lacks waterproofing and NFC connectivity but does include support for memory expansion via MicroSD and does include a headphone jack. Oppo are selling the device in two colors: Glaring Gold and Glaze Blue. The Oppo AX7is available through Optus prepaid from this week at an RRP of $319. Oppo say that the rest of their usual retail partners (Officeworks, The Good Guys, Woolworths, Mobileciti, Telechoice and Yes Distribution) will have the AX7 from a later date. We reviewed the previous Oppo AX5 last year and came away impressed. In our review, we said that "there are better and cheaper phones out there than the Oppo AX5. However, if you’re looking for that classic Oppo blend of long battery, snappy performance and low-price - the Oppo AX5 subscribes to that formula and yields strong results." We're expecting pretty much the same from the AX7. Look forward to our review in the near future. The Oppo A7X goes on sale through Optus this week.